BOB ABERNETHY, correspondent: An overflow crowd turned out to hear assessments of the impact Pope Francis is having on Catholics and others, including Washington officials. The moderator was longtime Catholic leader John Carr. JOHN CARR (Director, Initiative on Catholic Social Thought and Public Life, Georgetown University): Who would have thought that in the fall of 2013 Washington would be a place of paralyzing polarization, complete dysfunction and stalemate, and the Roman Catholic Church would be a place of renewal and vitality? 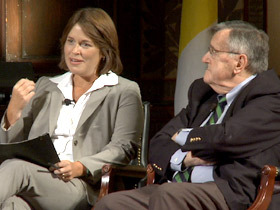 ABERNETHY: The panelists included PBS NewsHour regular Mark Shields, Kim Daniels, a spokeswoman for the Catholic bishops, Alexia Kelley, representing Catholic philanthropists, and columnist David Brooks of the New York Times and the NewsHour. DAVID BROOKS: What it looks like is less about abortion, less about gay marriage, and more about a counterculture, a comprehensive counterculture. That Francis just looks like a Christian. And so with Francis it looks more like to confront the forces of the world he has adopted the powers of Christ. KIM DANIELS: He’s really talking about love in action and living that out, and what I find so striking about the symbols and the actions that Pope Francis is witnessing through is how often they really mirror Jesus Christ. So it’s the crowds, letting the crowds come to him, right, and they can touch him and they are coming right up to him, or it’s particularly the children and the handicapped we see Pope Francis reaching out to and kissing and touching. It’s just a wonderful example of mirroring the Gospel, and in this day of so much chatter the only way we can break through that chatter is through these powerful images. He is really bringing Jesus to the world. ALEXIA KELLEY: And I think especially for young people that sense of integrity and authenticity in the action and the word is very powerful. MARK SHIELDS: I cannot think of a single public figure—secular, religious, or any other kind—who has inspired, provoked the level of civil discourse and discussion and animated exchanges that this man has. ABERNETHY: But could all the adulation of Francis be too much? BROOKS: Francis’s core message is the person of Francis. The risk therein, it seems to me, is the Church is not only a feel-good institution about a humble guy. It is a doctrine and a creed, and it is a specific set of beliefs and convictions, and they are beliefs that are reasonably tough-minded, and if you lose contact with the doctrine, the stuff that actually makes outsiders a little uncomfortable, with a charming guy who washes people’s feet, then you are losing something elemental to the Church. ABERNETHY: But as a flag moved behind him, Shields had a different emphasis. SHIELDS: He answers the question, or asks the question that all of us have to answer. Not are you better off than you were, but are we better off? Are the strong among us more just, are they more humane, are they more engaged? Are the weak among us more secure, more comforted, and more valued? And to me that is a message that we need desperately in this country and in this world. 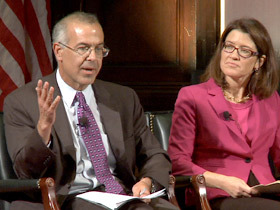 ABERNETHY: After the discussion, I asked John Carr what he thinks Washington officials think of the pope. CARR: I think they don’t know what to make of him. This is a humble man who has a powerful position, who won an election that no one expected him to win. He was 41st in the betting line, and he has decided that his belief in Jesus Christ means that he will speak for the poor, for the vulnerable, for the immigrants in a way that I think touches hearts, even the hearts of Washington. On October 1, Georgetown University hosted a panel to discuss the influence of Pope Francis’ leadership on American public life six months after his election. The discussion was moderated by John Carr, director of the new Initiative on Catholic Social Thought and Public Life at Georgetown University. He was joined by PBS NewsHour’s Mark Shields; Kim Daniels, a spokeswoman for the Catholic bishops; Alexia Kelley, representing Catholic philanthropists; and columnist David Brooks of the New York Times and the NewsHour.